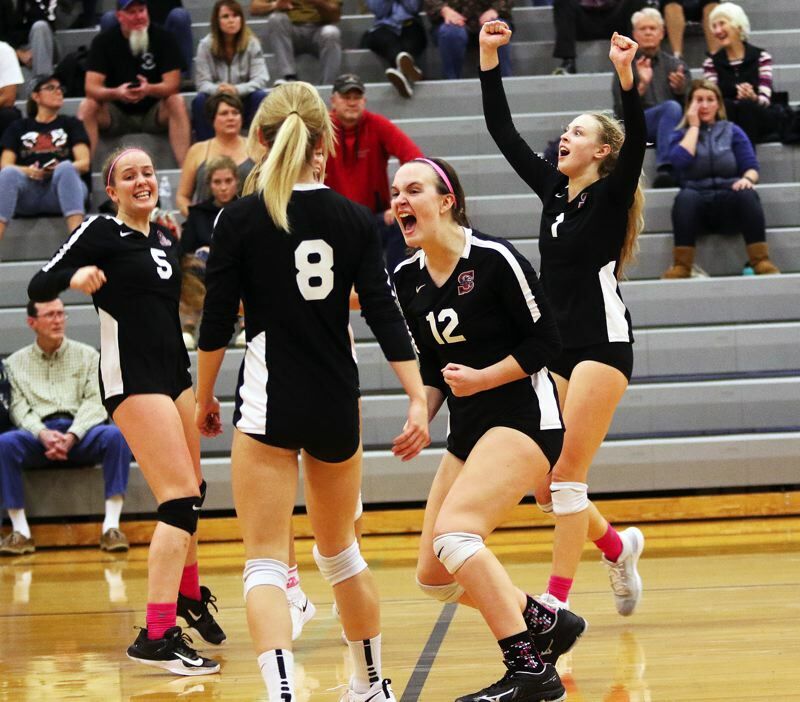 SHERWOOD — The Sherwood High School volleyball team rallied. The Lady Bowmen rallied strong. They rallied over and over again. But, in the end, Sherwood fell one rally short. 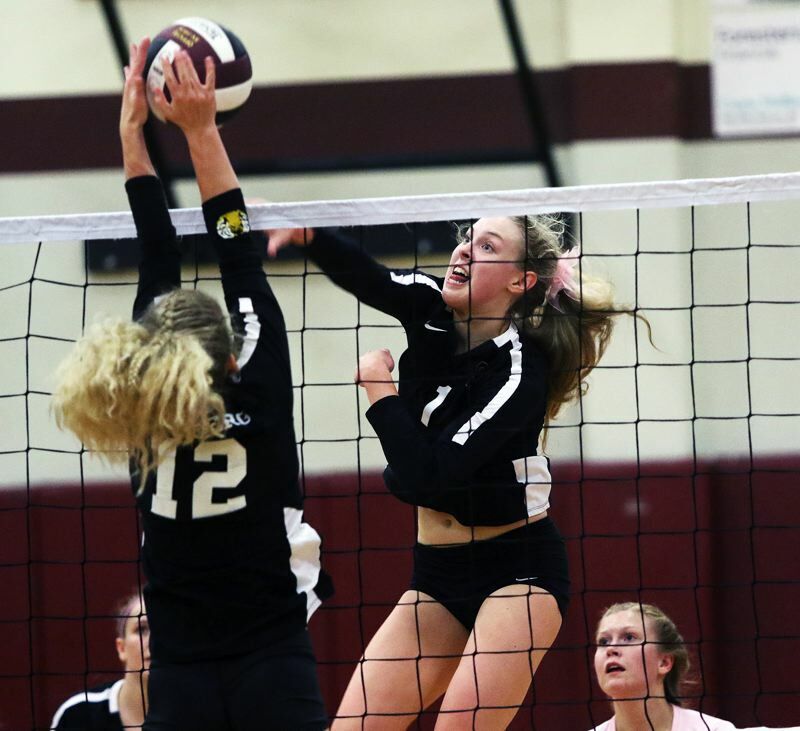 The Lady Bowmen, despite their determination, were edged 25-21, 19-25, 25-17, 24-26, 16-14 by Newberg in a Pacific Conference match held Monday at Sherwood High School. "We played really intensely, but it just didn't come together in the end," Sherwood junior outside hitter Alli Douglass said after the match. "We wanted it really bad, it was just a couple bad calls, bad plays and we barely lost." "We fought, but, in the fifth set, we just lost our momentum toward the end," Sherwood senior libero Alyssa Dillree said. 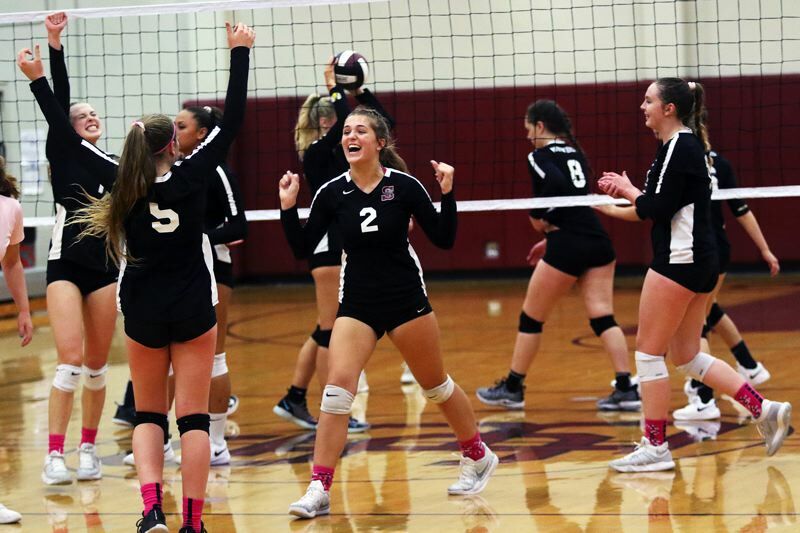 With the loss, Sherwood moved to 6-4 in Pacific Conference matches (9-7 overall) putting the Lady Bowmen in a tie with Liberty for second place in the conference standings. Glencoe leads the way at 7-2. "We've been fighting really hard, but things haven't always gone our way," Douglass said. "But we're going to come out swinging. We'll come out the next two matches swinging even harder, passing better and serving stronger." Newberg moved to 5-4 in conference play, and to 10-8 on the season, with the victory. The Tigers, in Monday's contest, got off to a strong start, winning the opening set by a 25-21 score. Newberg then looked to be in charge in the second set, taking a 17-8 lead following an ace serve by junior Lauren Griswold. But that's when Sherwood came battling back. Following a sideout, the Lady Bowmen, with junior Piper Harrop serving, scored 14 straight points to take a 23-17 lead. 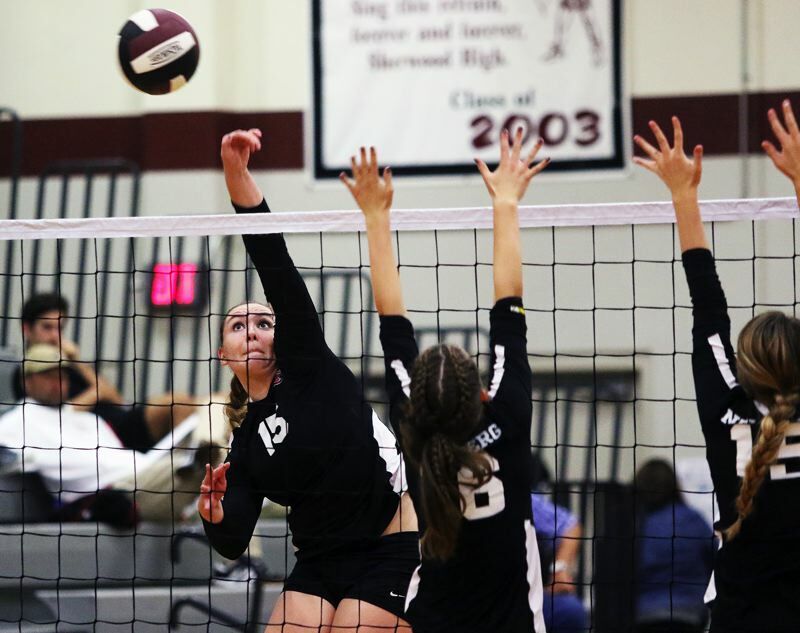 Harrop had two ace serves during the scoring spree, which also included a pair of kills by Douglass, a block and a kill by senior Alyssa Haslip and a block by junior Josie Wilson. Newberg closed the gap to 24-19, but Sherwood closed out the 25-19 second-set win on a point on serve by Dillree. Sherwood, trying to capitalize on its momentum, jumped out to a 7-6 lead in the third set. Newberg tied the score on a back-row sideout kill by senior libero Grace Kassebaum. Newberg followed that up with a kill by senior Giselle Benetti and back-to-back aces by junior Kaylie Duckworth to go up 10-7, and Newberg would lead the rest of the set. The next time Duckworth was serving, the Tigers scored six straight points to take a 24-16 lead. Newberg closed out the 25-17 win on a kill by Benetti. In the fourth set, Newberg went up 24-20 on a kill by junior Rebecca Upchuch, and looked to have the match in hand. But Sherwood had other ideas. Following a sideout, and with Dillree serving, the Lady Bowmen scored five straight points to come from behind and get a 26-24 fourth-set victory. "My hand was shaking," Dillree said with a laugh. "We got the energy. It was awesome. We just really wanted to win." The fifth, and deciding, set was a battle from start to finish. Newberg grabbed a quick 2-0 lead, but Sherwood, getting kills by junior Julia Leitzinger and Douglass, both coming off sets by junior Allison Fiarito, quickly tied the set at 2-2. The Lady Bowmen would take a 7-6 lead on another kill by Leitzinger, but Newberg rallied back to take a 10-8 advantage. Sherwood would fight back to tie the score at 11-11 on a kill by Douglass. The Lady Bowmen then got a kill by junior Claire McGill, followed by a Newberg hitting error, giving Sherwood a 13-11 lead. Newberg rallied, getting kills by junior Tori Petersen sandwiched around a Sherwood hitting error, to take a 14-13 lead. Sherwood tied the score, at 14-14, on a tip by Fiarito, but a sideout kill by junior Petersen gave Newberg a 15-14 lead. Then, with senior Carly Cuddeford serving, Sherwood was whistled for a net violation, giving Newberg a 16-14 fifth-set win, and the match. "We fought really hard in the second and the fourth set," Douglass said. "We pushed through a lot and we pulled it out. But it was hard. The last set was hard." "This was pretty intense," Dillree said. "We'll come back and practice hard." The Lady Bowmen will be back in action on Wednesday, when they host Century in a conference match starting at 6:45 p.m.